Lack of clean water is a daily reality for an alarming number of people: Three in 10 people lack access to safe, readily available water at home, and six in 10 lack safely managed sanitation. Water and sanitation services are essential foundations of development. They affect health, nutrition, education, income and gender equality. Stakeholders around the world are collaborating towards the solution, articulated in the United Nations’ Sustainable Development Goal No. 6, which promises clean water and safely managed sanitation for everyone by 2030. The Centre for Affordable Water and Sanitation Technology (CAWST), a Canadian charity, teaches people how to implement simple, affordable household solutions. To reach as many people as possible, as quickly as possible, CAWST trains trainers, policy-makers, implementers and community leaders so they can take action. Then its educators, researchers and engineers support clients by supplementing training and educational material with consulting support. From anywhere in the world, anyone can access CAWST’s online knowledge bases and free, open-content resources. The goal is to make its contribution toward that sustainable development goal. But what does achieving that solution look like? At the community level, one can see what the solution looks like in the story of Luis Pushaina, a young Biosand filter technician from Colombia. For the past two years, CAWST’s global water, sanitation and hygiene adviser, Eva Manzano, has trained and coached Pushaina to deliver and promote effective water, sanitation and hygiene (WASH) training and also taught him how to install the Biosand filter. Now Pushaina is helping his rural settlement in La Guajira by conducting a needs assessment and identifying safe drinking water as his remote community’s main need. Through his work, women in the region, which has a matrilineal culture, are learning how to access safe water for their families. At a regional level, we see it in the recognition in Latin America that conventional sewered and piped systems are not the only solution for providing quality, affordable water and sanitation services. Non-sewered sanitation systems and household water treatment can complement traditional community systems. 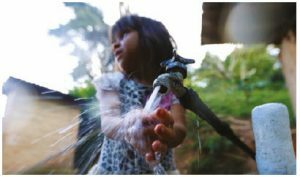 In Colombia, for example, there is new legislation regarding universal access to basic water, sanitation and hygiene services. It recognizes that to reach full coverage for the most vulnerable populations in rural and dispersed areas, traditional implementation approaches are not sufficient. Colombia is paving the way for other countries in Latin America that face similar challenges in reaching everyone. The progress achieved in Colombia can demonstrate to other governments and international institutions the feasibility of implementing non-networked solutions at scale. To learn from Colombia’s experience, share with and learn from other partners, and jointly advance the water safety agenda in the region, the Latin American water, sanitation ad hygiene sector gathered in May in Bogota. The WHO/UNICEF International Network on Household Water Treatment and Safe Storage hosted the first Latin America regional workshop, titled ”advancing the water safety agenda.“ The government of Colombia, the Pan-American Health Organization, WHO and UNICEF, with the support of Eva Manzano and other members of the network, led a workshop that engaged close to 100 stakeholders from Canada, the U.S., Ireland, Switzerland and a dozen Latin American countries. The problem is complex, and so is the solution. There has been a tendency to focus on hardware, such as wells and latrines. But without parallel investments in capacity development, hardware projects are likely to fail. The Rural Water Supply Network found in 2007 that an average of 36 per cent of hand pumps across 21 countries in Africa were non-functioning. That represented a total investment of between $1.2 billion and $1.5 billion US over 20 years. Clearly, infrastructure is only part of the solution. Systems for long-term operation and maintenance are essential. Legions of skilled water and sanitation practitioners are needed. Moreover, change in the behaviour of billions of individuals in their daily water and sanitation practices is vital for results that are sustainable across generations. Ultimately, CAWST sees a world where people have the opportunity to succeed because their basic water and sanitation needs have been met. This is its vision and contributing to that vision is its mandate. From Colombia to Nepal to Zambia, CAWST’s capacity-building approach is working. Since 2001, CAWST’s network of clients and WET centres has reached 1 million people better water or sanitation. Visit cawst.org to learn more. Ana Hoepfner is CAWST’s marketing and communications adviser.